Assurance frameworks, quality systems, risk registers and strategic plans do not operate in a vacuum. The host of mechanical elements which contribute to good governance would not achieve results were it not for the dynamic individuals and teams who strive for continuous improvement. Recognising that talented, skilled and ethical leaders are at the core of good governance, we deliver tailored coaching and mentoring support both to teams and individuals. Utilising a network of senior peers from across multiple sectors, who can offer unique and valuable insight and inspiration, our approach is to support the development of a holistic set of skills and capability which directly contribute to individual and wider organisational development. As part of our commitment to continue developing and promoting the Governance Body of Knowledge, GGI are always looking for interesting and innovative ways to communicate and engage. 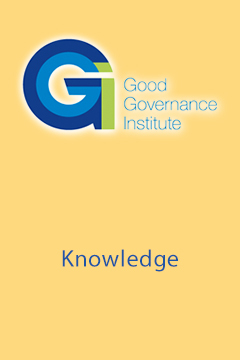 Drawing on the experience of different local government, health, education, third sector, commercial and social care systems from across the UK and internationally, GGTV is a forum for sharing ideas and discussing the future of governance. Content ranges from established best practice to emerging solutions and concepts and includes live-streamed events and discussions. We hope that GGTV offers a fun and stimulating view into the world of governance, and we are always eager to include contributors, new ideas and suggestions on our YouTube channel. We aim to leave no stone unturned when it comes to developing and disseminating best practice and new perspectives. Modern governance means looking beyond the remit of traditional organisational boundaries and established resources. As such we participate in a variety of international engagements aimed at tracing improvement and inspiring innovation. These range from recognised international conferences to unique and focused study tour opportunities (for example, our recent trip to Bangalore exploring examples of Jugaad – frugal innovation). These engagements offer unique opportunities for personal growth and development, as well as contributing to international networks of good governance. The Festival of Governance is the only place where so many governance people meet, deliberate for so long and contribute so much to governance matters across so many different sectors. Designed as much more than an annual conference, the Festival celebrates and discusses best practice thinking and governance developments, and utilises content developed in collaboration with partners across the year. This allows Festival attendees to engage and contribute beyond a ‘moment in time’ conference structure, leveraging work undertaken and tangible examples in contributing to an improved understanding of all aspects of good governance. Our next Festival will be held on 19 September 2017 – follow this link for details.